The height of the cut is one of the most critical issues in keeping your lawn healthy. While each type of turfgrass has a recommended clipping height, you can not go wrong mowing any turfgrass at a minimum of 2 inches tall. Many still believe mistakenly that short grass grows more slowly. Tall grass grows more slowly--Grass mowed tall grows more slowly and, therefore, needs less frequent cutting. Because it still has plenty of foliage surface to collect energy from the sun, it isn’t compelled to quickly replace the lost leaf surface. Tall grass reduces water needs--Tall grass has the energy to grow blades and roots simultaneously. Deep roots help grass plants handle drought because they have access stored water deep in the soil. Also, tall grass shades the soil, reducing evaporation of its valuable moisture and cooling the crowns of the grass plants. Tall grass reduces fertilizer needs-- Increasing grass height only 1/8 inch adds about 300 square feet more energy-collecting leaf surface for each 1,000 square feet of lawn. So, it has a greater ability to produce its own food and less need for fertilizer. Tall grass reduces weeds--Mowing northern turfgrasses a minimum of 2 inches high discourages weeds. The longer blades shade the soil, blocking the ever-present weed seeds from the sunlight they need to germinate. Tall grass reduces disease and insect problems--Tall grass is healthy grass and healthy grass resists disease and insect problems. In addition, it harbors populations of beneficial insects that control pest insects for you. It protects beneficials such as ants and spiders from their own predators. Grass is happiest when it is mowed lightly and frequently. The rule is take no more than 1/3 the length of the blade each time. Taking more than 1/3 of the grass blade at one cutting stresses grass plants. Their capacity to receive enough sun to make energy to grow is seriously reduced by the removal of so much blade surface. Cumulative stress leads to problems with insects, disease, and weeds. If more than 40% of the grass plant is amputated at one time, it stops producing roots. All its energy is devoted to replacing lost foliage. Over the long term, shallow roots reduce the grass's vigor and its ability to withstand dry periods. So, frequent mowing and cuts limited to 1/3 of the blades definitely make a difference in the health of your lawn. Mow grass growing in partly shady areas higher--by about 1/2 inch--than your grass growing in the sun. Because it gets so little light, this grass needs maximum leaf surface to compensate for the light deprivation. Use a ruler or make a measuring stick to determine if grass is 1/3rd taller than the preferred height and it is time to mow. If the desired standard is 2 inches, then mark the stick at 3 inches, set its end in the turf. If the blade tips approach the 3 inch mark, it is time to mow. If measurement shows that the grass is way above the 3 inch mark, then avoid cutting more than 1/3rd by mowing twice. Raise your mower to cut at 3 inches, wait a day or two, then lower the mower to the 2 inch height and mow again. It is possible to mow the lawn too high. Lawn grasses maintained much taller than 3 inches fail to form a nice uniform, close-knit turf. They are healthy, but they don't look as good as lawns cut somewhere between two and three inches. They may fall over and mat in rainy weather and then have difficulty drying out. Northern grasses grow at different rates in different seasons. Because fastest growth occurs in the cool seasons, spring and fall, mowing is more frequent then. Slower summer growth means less frequent mowing. While adjusting mower height to correspond with seasonal growth differences is often recommended, this extra work is not necessary. You can just mow tall all season. Mowing in the Spring - Although experts suggest lowering your mower to about 1 to 1½ inches for bluegrass-fescue lawns, to shear off winter-scorched grass foliage and excess dormant vegetation, there are several drawbacks to this practice. Access to more light and heat speeds up grass growth unnecessarily. It risks germination of light-loving weed seeds that are always lurking in the soil, as well as denying protection to beneficial ants and spiders that prey on pest insect eggs. Try a compromise. 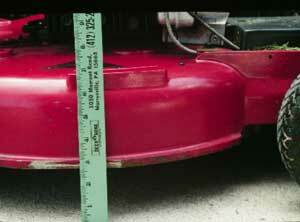 Lower the mower height to 1½ inches for just the first mowing in the spring. Then immediately raise it back to at least 2 inches for the rest of the season to thwart weeds and pest insects. Mowing in the Summer - While a standard mower height of 2 inches is always fine, an increase to 2½--or even 3--inches benefits the grass in summer. Close mowing in hot weather weakens cool-season grasses, the heat stress increasing their respiration and use of nutrient reserves. They turn brown and go dormant to cope with the heat. It makes sense to minimize defoliation at this time. So, it is advisable to increase the cutting height of cool-season grasses somewhat during the warm, dry summer months. Mowing in the Fall - As temperatures moderate in the fall, lower the mowing height to two inches again. While traditional practice includes lowering the mower to about 1 inch for the last mowing of the season to stimulate the development of encourage shoots from the base of the grass plants that will thicken up the turf for the following spring, it is not necessary. Mowing shorter than 1½ inches is OK in the cooler fall weather, but it exposes turf soil to lots of light which may germinate weed seeds if there is an Indian summer or a very mild winter.